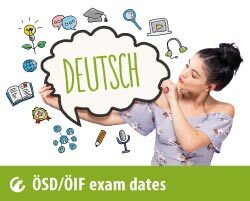 Together we´ll find the right German course for you! All of our German language courses are in accordance with the Common European Framework of Reference for Languages (CEFR) level system (A1, A2, B1, B2, C1). Vienna Language Coupons – „Wiener Sprachgutscheine“ (MA 35). Our intensive German language courses as well as our „one to one“ lessons meet all the requirements of AMS (Employment Market Service) and are eligible for AMS funding. – We will prepare an appropriate offer for you! Contact us now! Successfully learn German efficiently and systematically. Begin speaking German from the very first lesson. BENEFIT FROM FELLOW PARTICIPANTS and our communicative teaching methods. Lessons using an ideal combination of goal-oriented and original materials. Get your money’s worth in comparison to other teaching methods. Compact group language courses with a minimum of 6 to a maximum of 9 participants. All of our trainers have a university degree and extensive language teaching experience.